OLFA Fairy Floss Pink Splash Rotary Cutter 45mm. This rotary cutter has a quick-change blade. It is designed for both right and left hand use. It will cut multiple layers of fabric at once. Blade cover included for additional safety. All OLFA handles are guaranteed for life under normal usage. Use any OLFA straight rotary replacement blade with this cutter. Extra-fine pins, which smoothyl pass through fabric. Useful for precise pinning in delicate piecework and applique. Head is made of Iron proof glass. 100 pins/case. Size is 0.40 x 36 mm. An air-soluble marker with an eraser. Markings naturally disappear in 4 to 14 days. Singer Professional Series Seam Roller. The Singer Pro Series is perfect for a quick press of the seams at a sewing machine. No need to stop and iron fabric mid-project. Simply press and roll to create a sharp seam without distorting the fabric or paper. Use this tool to flatten and secure open or glued seams on leather or felt. The plastic seam roller is also great for quilting, especially paper piecing. 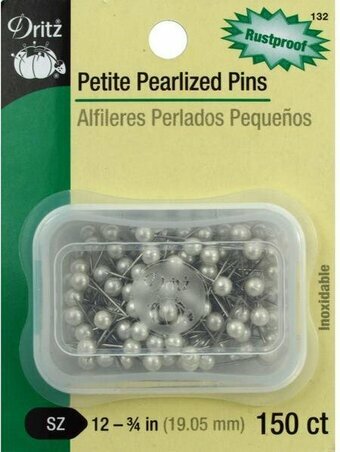 Stainless steel pins with white pearl heads. Packaged in a plastic storage box. Nickel-plated steel pins in a reusable plastic storage box. Easy to use batting stuffing stick. Stick tip is angled and wider for easy stuffing. Flat and easy to hold handle gives stability in pushing and makes detailed work easier. Convenient for small areas such as sections of trapunto quilts and doll making. Taylor Seville 3 In 1 Mark & Trace. This marking pen/tracing wheel combination includes European-quality Tailor's Chalk, a serrated tracing wheel and a smooth tracing wheel. The chalk applies smoothly and wipes off easily. Handy storage for the tracing wheel. Quarter-inch diameter chalk. Chalk comes in pink, white, and blue. Includes chalk sharpener. Tulip Needle Company Applique Needles. These needles have a large needle eye and are flexible and warp resistant. Runs smoothly through fabric. This package contains 6 needles in one size. These needles have a large eye, are flexible and warp resistant and run smoothly through fabric. Perfect for patchwork. This package contains 6 piecing needles in one size. Tulip Needle Company Quilting Needles. Perfect for hand quilting. These needles have a large needle eye and are flexible and warp resistant. Runs smoothly through fabric. Six needles per package. These needles are best used for silk, thin cotton and all very thin fabric. Their superior polished finish allows them to glide easily through the fine fabric. This package contains 6 silk needles in one size. Holds slipcovers - arm covers and bed skirts in place. Rust resistant. Temporary chalk that disappears in 2 to 3 days. A high quality, shrink-resistant material that stretches easily and resumes its original shape and length over and over. The most versatile version of elastic that can be used. Insert into casing or stitch directly on fabric. Use with light to medium-weight fabrics. Polyester/Rubber blend. 1" x 2 1/2 yd.